A news producer with high ideals named Jane (Holly Hunter) is torn between her like-minded best friend Aaron (Albert Brooks) and the handsome but slightly dimwitted Tom (William Hurt), who has just joined the news team. Written and directed by James L. Brooks, the Academy Award nominated "Broadcast News" is a semi-romantic comedy set against the backdrop of a network news studio in Washington D.C. It stars Holly Hunter as news producer Jane Craig, who has high ideals about integrity in news and strong opinions on what constitutes a newsworthy story. Her best friend Aaron Altman, played by Albert Brooks, shares those same ideals and always delivers well researched, important news. He also has a clear romantic interest in Jane, though those feelings are mostly unrequited. Jane starts to fall for Tom, played by William Hurt, a handsome but sort of dopey sport anchor who represents everything she fears the news industry will become, though she doesn't see it at first. Tom is the pretty talking head who is interested in making himself the center of attention in a story in order to get ahead in the business. He simply reads what other people have written without thought or care, putting little to no research in his stories himself. Unsurprisingly, the audience loves him, his bosses love him, and Jane thinks she's falling in love with him. All of this is going on while Aaron, who puts in the majority of the hard work and research, is passed over by everyone and anyone, including the woman he loves. Hunter, Brooks, and Hurt put on three great performances alone, but together, they are really a wonderful cast of characters. Each of them received Oscar nominations for their parts, and though none of them nor the movie itself took home any trophies, it's still an enjoyable film. In many ways, "Broadcast News" saw the writing on the wall about where television news was going and got there before any of us ever did. Jane feared news reporting was moving further and further away from hard-hitting, important stories, and more towards infotainment fluff pieces. She feared news networks would focus on high ratings more than high standards. As we all know, today, news has completely shifted into exactly what Jane Craig feared: it's all about fluffy infotainment pieces of celebrity gossip and who is saying what on Twitter. Click-baity headlines get viewers to tune in, not pieces on the wars in the Middle East and coups in third world countries. But hey, whatever will get people to tune in, even if it means preempting an important interview with a head of state fo we can hear about Justin Bieber's latest legal woes, right? It's depressing that a movie from the 80's predicted this. 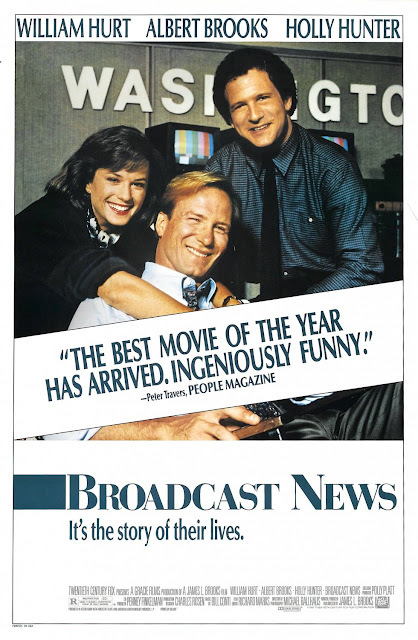 Overall, "Broadcast News" has a lot to say about values and morals in news. It's a pretty funny film with some solid performances and a great story. One year ago, we were watching: "Fatal Attraction"